7:00-8:00 am: Wake up and feed the animals. This included roosters, chickens, three sheep (Betty, Babe and Barb), two miniature horses (Snowy and Bobby) and one goat (Patty). 8:00-9:30 am: Work was varied but typically included watering the garden, preparing garden plots for the next planting cycle, or collecting animal waste to turn into compost for the garden. 9:30-11:00 am: Break for morning tea which was often accompanied by a delicious treat prepared by Kylie and an hour or two of chatting about life experiences. 11:00-1:00 pm: Additional work on the farm such as rendering concrete water tanks, digging and lining a retention pond, or creating new compost for the garden. 1:00-3:00 pm: Lunch and more life chats. 5:00 pm: Gather the animals and put them in their pen for the night. Our pals Patty, Babe, Barb and Betty. 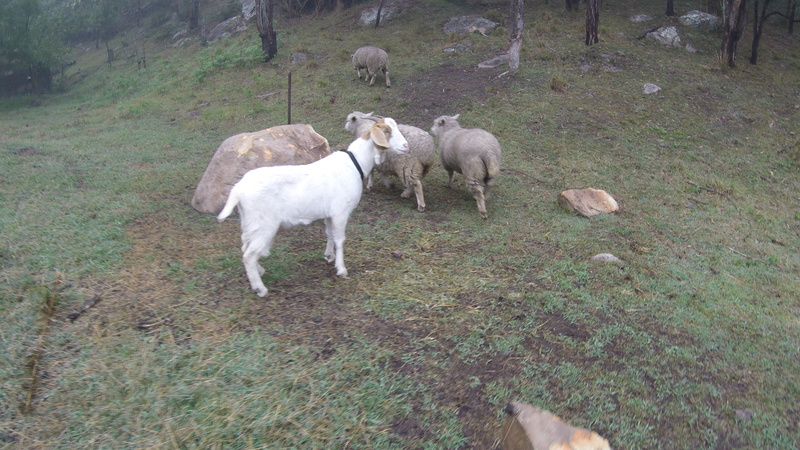 After leaving the farm, we took our time driving back to Sydney, stopping to car camp (with our station wagon, “Paddy”- no relation to our new goat friend) in small cities along the way. Once we arrived in Sydney, we headed to the airport to pick up Jeff, our good friend from Chicago who planned a two-week trip to Australia to visit us. The three of us spent about a week’s worth of time experiencing the outdoor beauty of Australia before we picked up the fourth member of our group, Jeff’s girlfriend Rachel. The highlights of our outdoor exploration revolved around the following: The Blue Mountains, kangaroo boxing and walking the oceanfront trail from Bondi Beach to Coogee. The Blue Mountains: One hour west of Sydney lay the Blue Mountains, named for the blue glow given off by the oil from eucalypt trees combining with dust particles and water vapor. There is a seemingly endless supply of bush hikes and scenic overlooks here and we were fortunate enough to experience a few of them. We booked accommodation at a great little cottage nearby (thanks Airbnb!) and were greeted each morning by a group of king parrots which are native to this part of Australia. We also saw bright yellow-crested cockatoos, which, unbeknownst to us, have incredible dexterity with their feet and are able to eat food using their feet as hands! The bird life is insane! 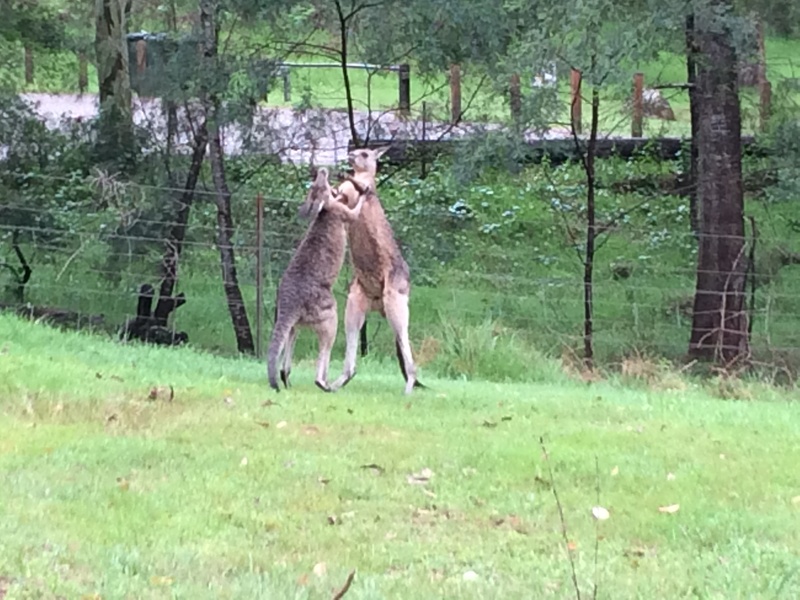 Kangaroo boxing: You can’t visit Australia without doing your darndest to find kangaroos out in the wild. Did you know that there are approximately 60 million kangaroos in Oz? That’s more than double the number of Aussies! We had read online about a clearing halfway between the Blue Mountains and Sydney where people had reported seeing kangaroos grazing about so we set out with one goal: find a kangaroo. It had been raining most of the morning so we weren’t confident in our chances but decided to head to the clearing anyway since it was en route to Sydney. After winding down a hill on a gravel path, we settled upon the clearing to have a better look. Moments after getting out of our car, boom, we saw one. Then another. Then a third with a joey in its pouch! But the fun didn’t stop there. Almost as if they were waiting for an audience, two younger kangaroos began “boxing” as we cautiously approached them. They would slap each other around the face, pause to stand on their tails and then kick one another with both legs! It was too good to be true. And the best part? We were the only three at the park to witness it. The biggest “wow” moment: roo boxing! Bondi to Coogee trail: We had heard great things about an oceanside trail that went from one beach to another, so we decided to check it out. It certainly didn’t disappoint! The trail went up and down the rocky coast and delivered incredible views out across the ocean. While we were there, the Sculpture by the Sea exhibit was being finished, so we got to see some really neat art as well! It was finally time for Jeff’s girlfriend Rachel to join the squad for our final week in Australia. Rachel, who lives in Chicago but travels frequently for work, spent about nine months living and working in Sydney a few years ago so we were excited for her to show us her old stomping grounds. And she was excited to reconnect with some old friends and coworkers she hadn’t seen since she lived in Sydney. She was generous enough to share some of her travel points with us while she was in town and put us all up in a Marriott overlooking the Sydney Harbour with views of the Opera House and the Sydney Harbour Bridge. Talk about a nice (and drastic) change from the budget traveling we’ve been doing all year! Not only were we in a very, very nice hotel, but we were able to enjoy a free executive lounge and other nice hotel amenities thanks to Rachel’s generosity. We were pumped just having a big comfy bed and a shower in our room, so the free snacks and drinks in the executive lounge were icing on the cake! On the ferry to Manly with the full squad! While Rachel was in town, we spent a few of days in Sydney, went to Melbourne for a couple of days, and then came back to Sydney to wrap things up. Our hotel was located in Circular Quay (which is pronounced “key”), a harbour very close to the famed Opera House and Sydney Harbour Bridge. Our downtown location presented some epic views of the city and allowed us to walk to many restaurants and pie shops nearby! However, the best views of Sydney came from a short commuter ferry ride we took across the harbour to Manly. As the ferry pulls away from Sydney harbour, you’re able to glimpse a panoramic view of the city. 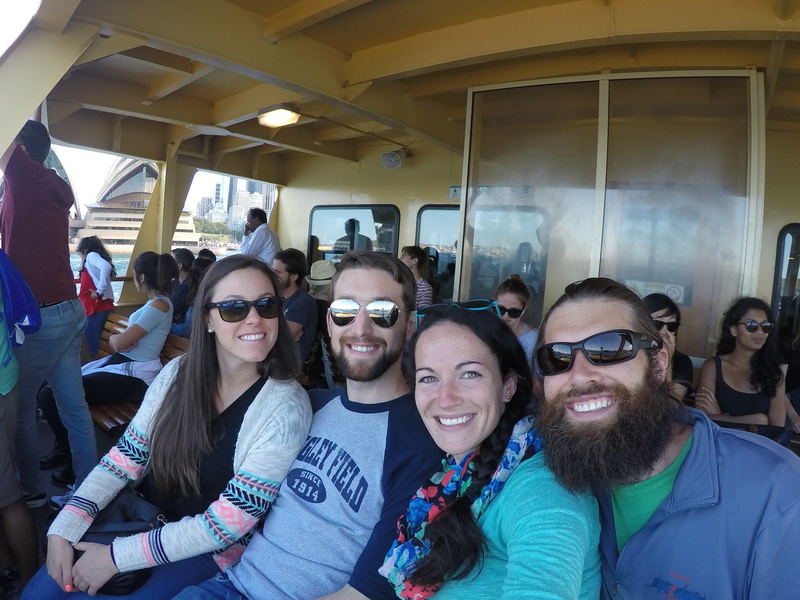 We highly recommend hopping on a ferry if you’re in the city and have enough time! Sydney was great, but Melbourne was definitely the highlight of our city life experience. The city is laden with great food and trendy establishments. We spent one of our days biking around the city exploring everything we could. This led us to some tasty time spent on Acland Street, which is known for all of the cake and dessert shops in the area. We were also able to check out Mountain Goat Brewery, a low-key and somewhat hidden brewery outside of central Melbourne. It’s open only twice per week on Wednesdays and Fridays, when they serve up great pizza and a really cool atmosphere (we ate on top of barrels). At the end of some long and fun-filled days, we even tried our luck at the Crown Melbourne, a centrally located casino. The trip to Melbourne was pretty quick (though the drive was long!) and we were left wanting more. We definitely plan to spend more time there whenever we get a chance to return to the land of Oz! The crew hanging out at Mountain Goat Brewery. Have you ever visited the land down under? If so, what part did you visit and what is your best memory from your time there? If you’ve never been, is it on your list? There is something for everyone with its beautiful beaches, epic mountain views, crazy wildlife, strong coffee and great pub food! See our latest adventure come to life on our Kimblesinbits YouTube channel or at the link below!